Best Performance Exhaust for Harley Davidson Reviews: Top-5 in April 2019! Exhaust systems can either replace the factory kit and deliver stock performance, or they can improve the exhaust flow and deliver increases in torque and power. When you decide on upgrading your exhaust system, you need to consider what you want it to do. As such, the modern exhausts are no longer tubes of metal that channel the exhaust out from the engine to the back of the bike, they are engineered to perfection, using top grade materials, creating special channeling effects for sound, while increasing the outflow and reducing obstruction that adds to the over performance. Add to this the various finishes and looks, including heat shields for leg protection, and you are looking at a world of wonder from a very basic component. Consider that apart from the performance you have sound and looks, so you need to consider all the features. Now looks are perceptual, and that implies that beauty is in the eyes of the beholder, only you, the rider can decide which system looks good for you. The sound is also perceptual, since you can only decide what sound you want your bike to make, and the exhaust system is what makes this decision for you. In terms of performance, this is objective, and you need to consider all the performance features that each system provides, so you can adapt and expect to reach certain levels beyond the factory stock. So, it comes down to these three factors: Performance, something you have to decide what you want from your system, and it is set, you get to choose objectively. Sound, well, just listen and decide what you like to hear, and finally looks, which can be both the most important or the least important of your decisions, it’s up to you. Now I present to you the 5 best performance exhaust for Harley Davidson for you to choose from. This is the Vance & Hines 47229 Shortshots Staggered Exhaust System for 2014-2018 Sportster models. When it comes to hot-rod sounds, this is the exhaust kit you want to buy. It comes with a full length heat shields, and comes in either chrome or black finish. This is a staggered exhaust system, and its priced at a very low and convenient level, which is another great feat from Vance and Hines. This model comes with a 1 ¾” head-pipe that steps to a 2 1/8” muffler body with a 2 ½” 220o heat shield. This model delivers improvements in performance as well as sound, and comes at a fraction of the more aggressive models that they supply. 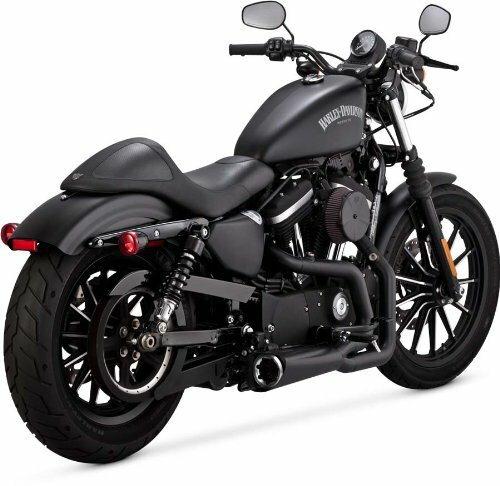 Do you own a 2014-2018 Sportster model? Are you looking for an exceptional exhaust upgrade? Then don’t look any further, this is proven to be the best of the best. It just is, dollar for dollar, the best. Vance & Hines Competition Series 2-Into-1 Exhaust Systems 75-118-9 for the all black XL883N models between 2014-2019. This is a competition series slip on the exhaust system that provides ultra-high drag race performance. This is a 2-Into-1 exhaust which is made from stainless-steel for rigged durability and comes with a tapered head pipe that connects with quick-access wideband oxygen sensor ports. The 75-118-9 is a lightweight model engineered to deliver performance as well as looks this model comes in a black ceramic coated or brushed finish, and included is a serviceable acoustic baffle. There are exhaust systems, and then there is the Vance and Hines competition series that blows the socks off as you ride. This is a high-end true sport model, and is well worth the investment if you are seeking top level upgrades for high quality performance. This is the Rinehart Racing RIN-100-0200 Xtreme Series True Duals 4″ Chrome Muffler for 2009 and up FLH models. This is a complete system, it’s the Chrome ‘Xtreme’ that comes with True Dual Header Pipes and 4” Chrome Mufflers that are finished off with Black End Caps. 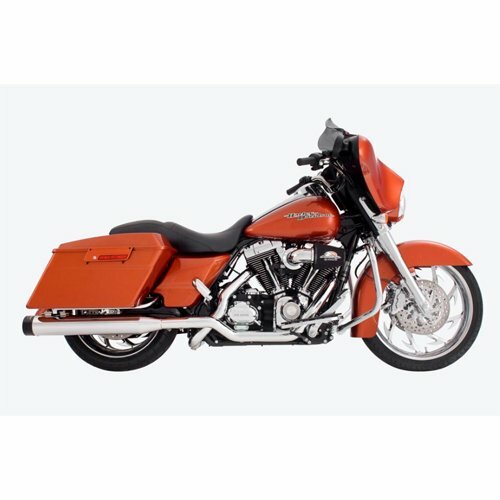 When it comes to exhaust airflow performance, it is hard to beat the Rinehart models for Harley FLH. This specific model comes with a streamlined flow design that has the minimum number of bends so that the exhaust airflow is as straight as it can get, without rebalance, without obstruction. Just pure outflow maximized for performance gains. This model comes with fitted 12mm and 18mm O2 sensor port, and sports a one-piece full length heat shield that protects your legs. This is a “Rider friendly” model that comes with a convenient header configuration routing the head pipes away from the rider’s legs. It also sports anti-reversion louvers that impact power performance by removing the negative pulse from traveling back into port. Yup, this is the one you have been seeking and couldn’t find, there is a lot to choose from, but only one best for the FLH models. This is the performance exhaust for FLH that goes beyond perfection, so don’t settle for anything less. This is the Freedom HD00060 Exhaust Declaration Turn-Outs Chrome Dyna 2-step performance system for 2006-2105 Dyna models. The Freedom Performance Declaration Turn-Out exhaust system are designed with a 2-step performance delivering a full range of torque and optimal horsepower. You can get this in a black or chrome finish and the model will fit all Dyna rides, delivering both performance and style. This is a dual type design that is made from chrome plated steel. There are two steel louvered mufflers with a single inlet and outlet configuration, and are also chromed. The exhaust tip is a chrome steal dual round port type. The model comes with a 16-gauge heat shield and removable baffles that can be replaced with quiet ones. The 02 ports are standard for OEM and upgrade configurations. 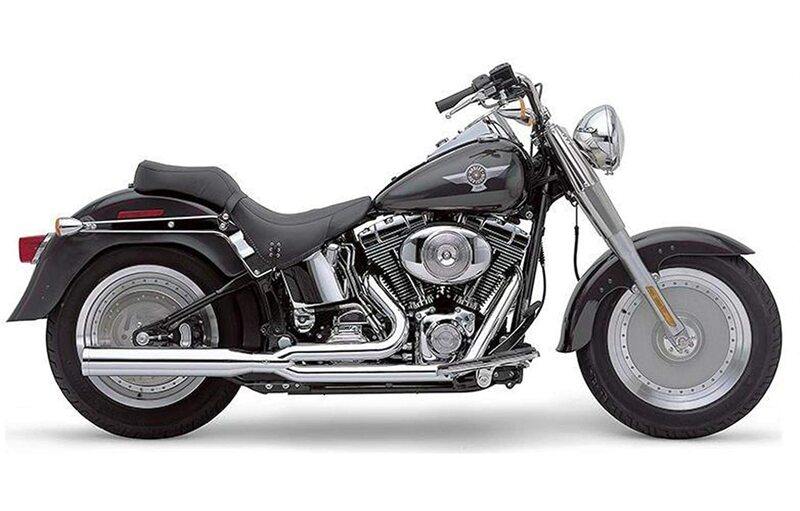 This is a classic performance exhaust system for the Dyna models, and is extremely popular. You will truly stand out and also enjoy this systems performance, with improved power and torque as well as spend. This is the Cobra Power Pro HP 2-Into-1 Exhaust Chrome model 6420 for a wide range of applications between 1993 to 2017. 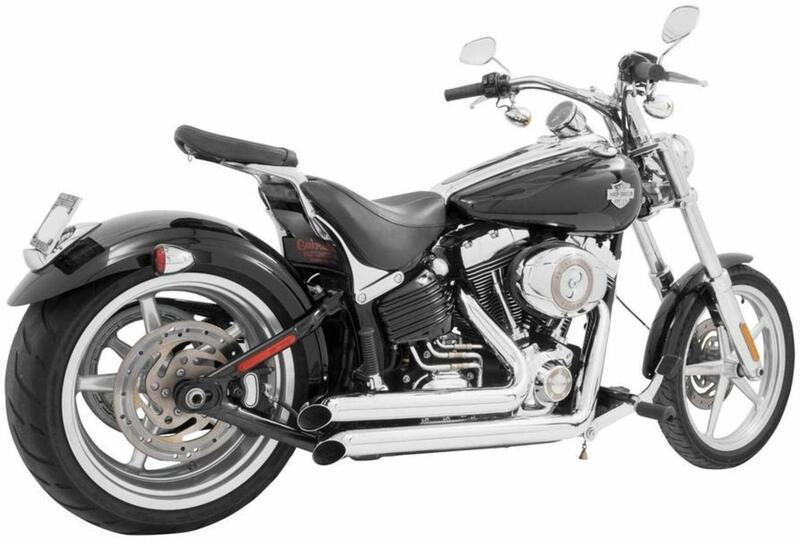 Not all performance systems need to cost a mortgage, this one is a budget friendly but extremely efficient, and powerful exhaust system for a wide range of Harley Davidson applications. The engineers at Cobra Power were seeking a popular performance exhaust at nominal cost without impacting performance, and this is what they came up with. They took the original PowerPro sleek cylindrical muffler a body with a megaphone and improved on its materials, design and overall performance while reducing costs. They ended up with a 3.5” chromed muffler body, 2 in 1 piping that eliminates blueing, and they added a 220o collector heat shield that covers the 2 in 1 junction with a chrome guard component. This added component removes the blue effect that overheated exhaust systems exhibit over time, as such you retain that clean chrome appeal of a new system all the time. The billet tip is a 3.75” megaphone comes with a beveled inner wall that adds pure style to the overall performance. This megaphone is double insulated to improve sound and heat protection. The finished product not only looks good, but it also delivers maximum power and torque increases as well as lasts longer than most competitors at a very comfortable price. 3.5” chromed aluminum billet tip. I closed the article with the best, at least in my opinion, that is generic enough to fit on a wide range of applications and comes at a very attractive budget friendly price. This is the peoples exhaust.